As the cult of the models as a celebrities in their own right has grown, so too has our fascination with what they wear off the runway. Dubbed “Model off-duty” style, the look is all about looking effortlessly stylish with clean lines, luxury basics and a cool attitude for an overall effect that screams “I woke up like this” even if the reality is it took you a little longer. For those looking on enviously, here are two bits of good news : 1) there is an easy formula you can use to channel the look, and 2) we’re about to share it with you. While the overall concept of the model off-duty look remains the same year after year, the key pieces that make up the look vary from season to season. 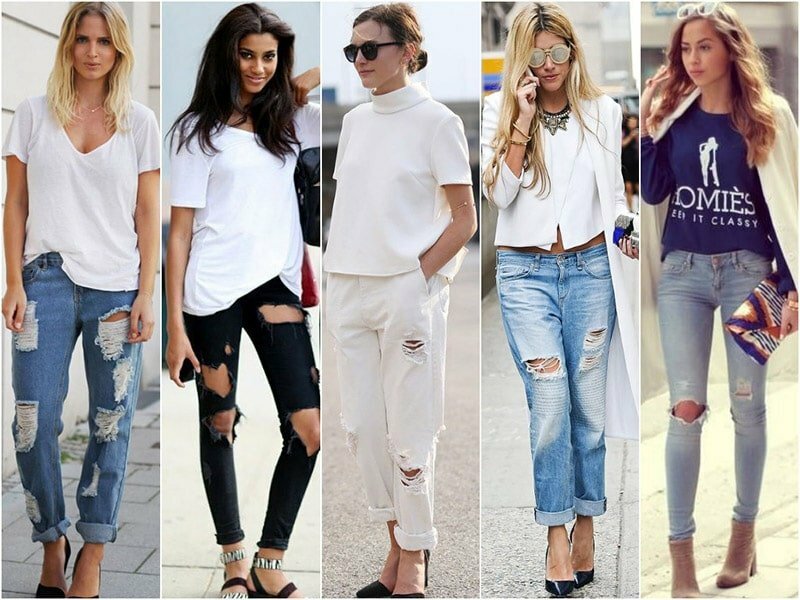 This season, it’s all about the stylish and reliable combination of the torn jeans and white jacket. While these may sound like an exclusive pairing, the look is actually rather versatile, with a range of styles and cuts available to make the ensemble flattering and suitable for any age and shape. 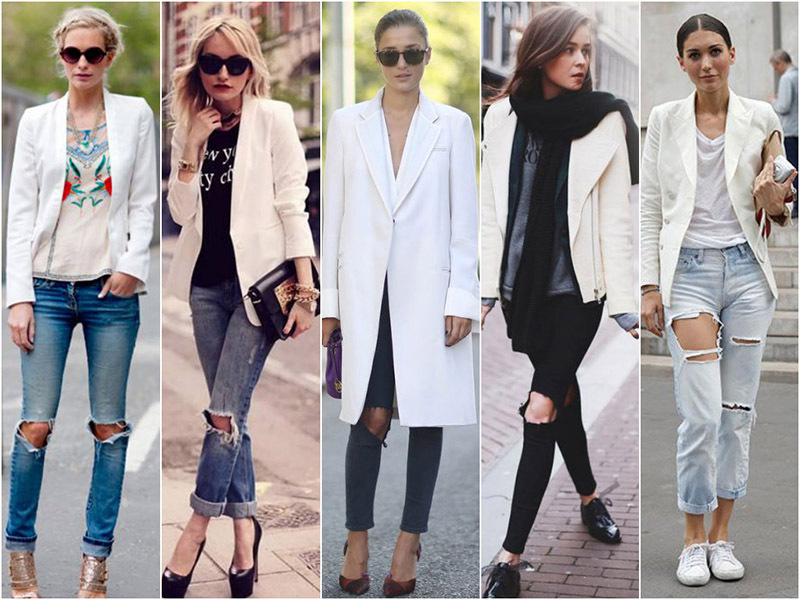 We’ve spotted white jackets in all manner of cuts and shapes, from cropped boxy shapes and sharp blazer styles to knee length light coats. For the most striking look, only the freshest whites will do, the perfect tone for both summer and winter. To channel the “effortless” vibe, pair the coat or a jacket with a good cotton tee or sleek, sharp white shirt – collar optional. You can keep it simple with minimal accessories, but don’t be afraid to add carefully chosen adornments too – an all white combo at the top is the perfect base for a bejeweled statement necklace! When it comes to the torn jeans, there are two main options – light and baggy or dark and slim. The distressed boyfriend cut jeans in light and or baby blue are popular with the street style set, perfectly cuffed just above the ankle. “Studies” aka our highly controlled observations show that the perfect number of rips is two or three – one large or frayed and one smaller one. Dress up the look with a pair of chic patent high heels, or play serious model with a pair of trainers. If baggy isn’t your style, then play around with a skinny pair in a darker wash, which makes for a great contrast with the white jacket. Just one rip is needed here around the knee area, and keep the look in proportion with a pair of simple heels. For a minimalist look, just slide on your favourite pair of sunglasses and tuck a coloured clutch nonchalantly under your arm. While you may look like a model off duty, your look will be totally on point.